Time to update you on the shed. As I posted earlier, the shed turned out to be a fairly quick and easy build. With a few custom touches, it fit right in with our cottage decor. 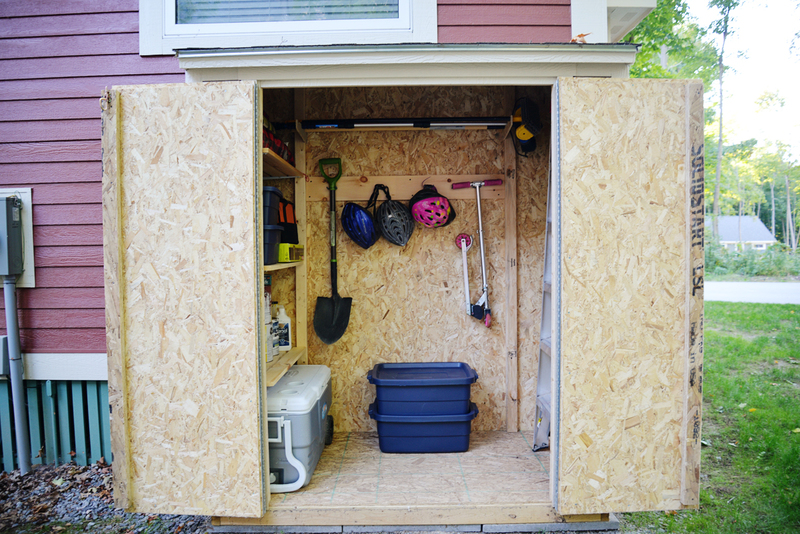 The final step was to get the shed truly functional and organized. This was how the shed was looking for a few weeks. It was easy to just pile things in the shed and pull them out as we needed them. We had room for all of our things (as disorganized as they were) so really, we could have just shut the doors and the shed would have functioned fine. But Sean likes his 'man caves' organized. Very organized. I mean, have you seen our garage?? He keeps his power tools and wood scraps neater than I keep my fabric swatches and rolls of gift wrap. I tease but I secretly love opening the garage door and seeing everything neat and orderly. 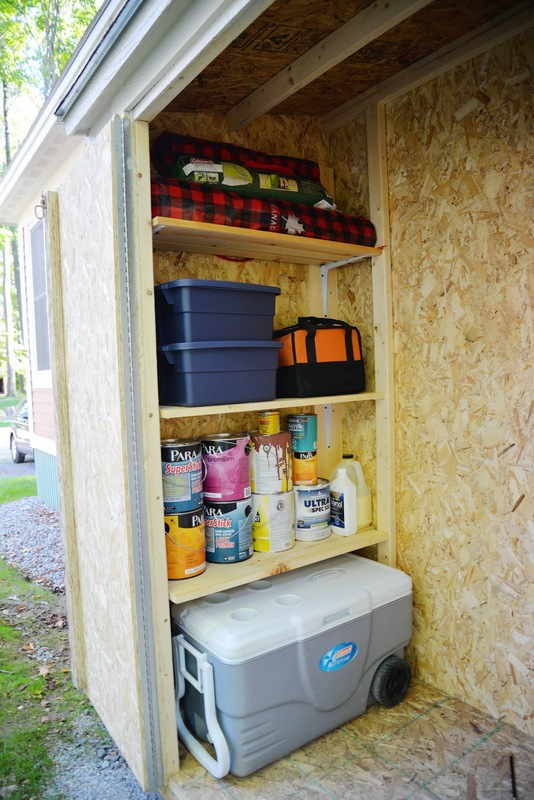 Which is why we put custom built-in shelving in the shed. Let's get organized! Sean first nailed in 1x6x8 boards in the corners of the left wall. The boards would be used to hold up the brackets. To determine the spacing with the shelves, we used the same approach we used for our kitchen renovation: take an inventory of all your items and size your shelving to fit. We knew that our biggest item would be the cooler and that would have to sit on the floor. (Side note: this cooler was a wedding gift. 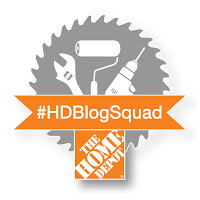 We had a wedding registry at The Home Depot Canada with items such as ladders, a router, and this cooler. True story!!). The cooler would determine the height of the first bracket. 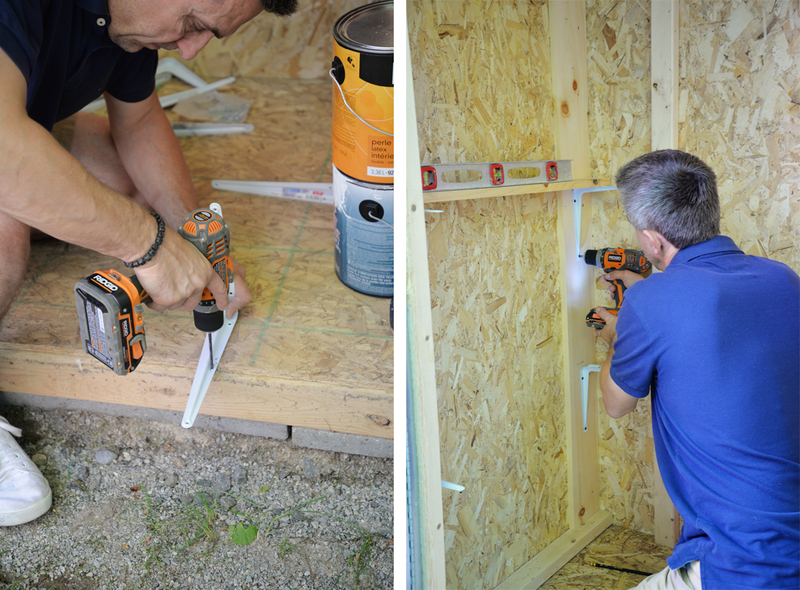 For the shelves themselves we used 1x4x8 boards cut to the width of the shed. We would need three boards to form one shelf. Since the metal shelf brackets we were using only had screw holes at the tips, Sean needed to drill two additional holes in the middle of one of the arms. This allowed him to screw into the middle board from the underside and provide additional stability. 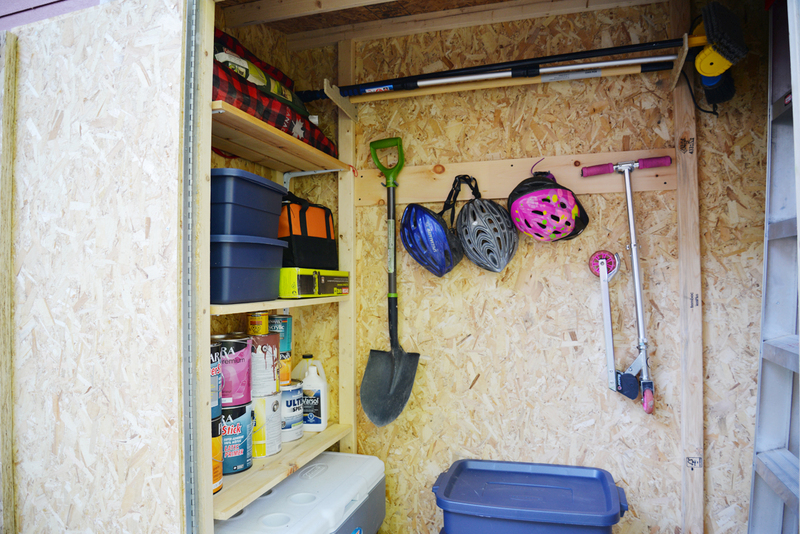 We were able to fit three shelves on one side of the shed. This left plenty of room to store our paint cans (they'll be moved inside for the winter), tool kits, and outdoor chairs. We also wanted to make use of the long back wall for storage. The shed kit came with long-handle storage brackets. 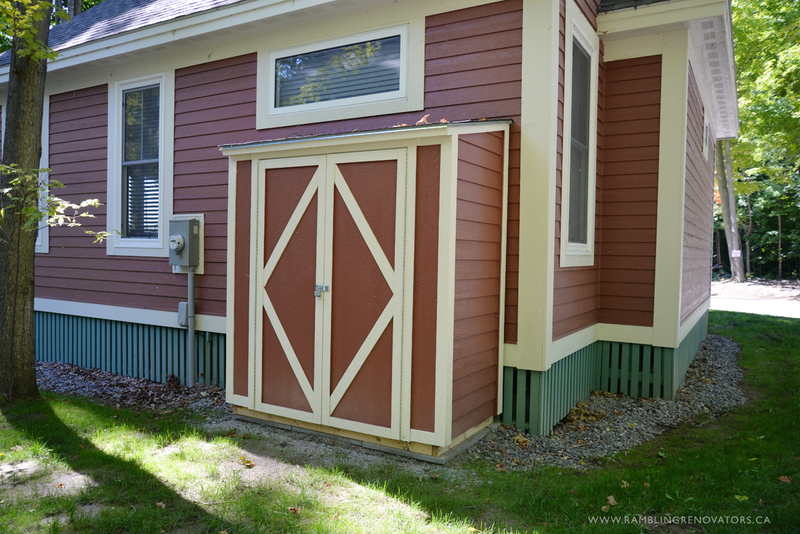 We installed these at the top of the shed and they provide a perfect spot for brooms, brushes, and a rake. Below that, Sean nailed in another 1x8 board. Various screw-in vinyl coated hooks are used to hold up more tools and toys. Additional lidded storage bins are used to separate and store other loose items like our painting drop cloths and work clothes. 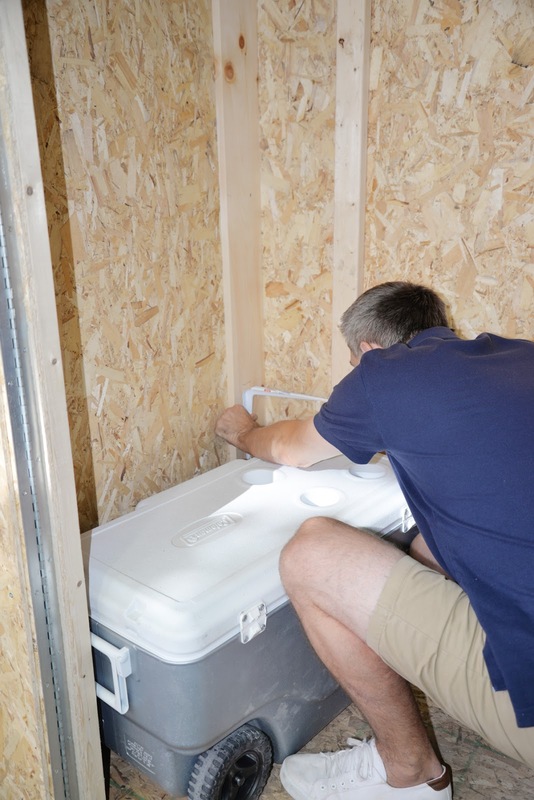 Keeping the storage containers consistent ensures they stack nicely and keep a small footprint. We've put our ladder on the right side of the shed, but if needs change, we can always add in more shelving. It only took us about an hour to build the shelves and store everything away. 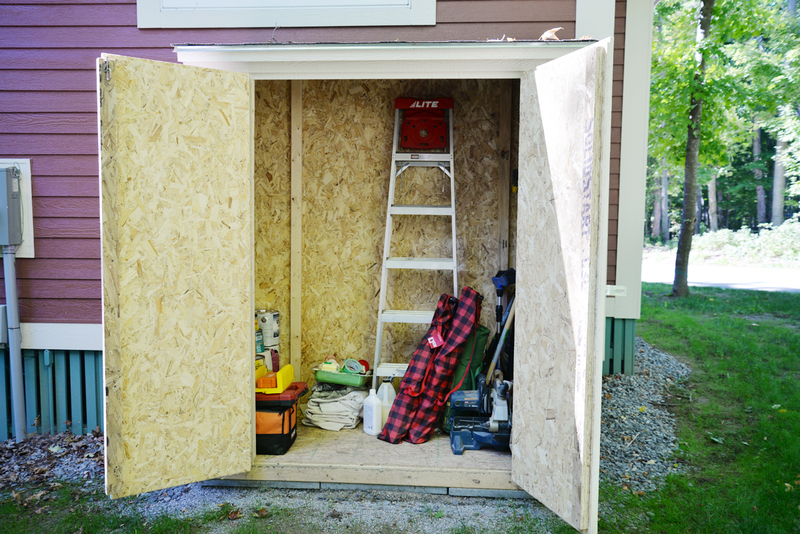 Sad to say the cottage season is ending and we won't be opening this shed again until next spring! Let's hope it stays this neat and tidy for many cottage summers to come.